Dr. Dylan Hunter is pictured Friday cutting a grand opening ribbon with one his daughters, Evelyn, at Hunter Family Chiropractic, 219 W. Main St., Hillsboro. Pictured in front to the right are his wife, Jordan, and other daughter, Lucy, along his parents, Sue and John Hunter. At 28 years old, Dr. Dylan Hunter has a lot on his plate. Not only is he opening his own medical practice, but he’s a new dad again. Baby Lucy was born a little over three and a half weeks ago. Influencing him early on was a chiropractor friend of his father, whose own father, Dr. Arthur Holmes, was a chiropractor in Hillsboro for many years. After job shadowing another chiropractor before graduation from high school, Hunter’s career path was set. Eight years of college followed and upon graduation 14 months ago, he was an associate doctor at Riley Chiropractic in Milford, and planned to make the Clermont County city his home, but Hillsboro beckoned. His wife Jordan has lived in the area since she was 2 years old, and with 2.5-year-old Evelyn and newborn Lucy, Hunter felt Hillsboro was a good place to put down roots. The practice accepts most insurance plans and Hunter takes a ‘golden rule’ approach when it comes to his patients. Hunter Family Chiropractic is located at 219 W. Main St., in the Beery Building, Hillsboro. Appointments can be scheduled either by calling 937-661-6060 or online at hunterfamilychiro.com. https://www.timesgazette.com/wp-content/uploads/sites/33/2018/08/web1_Hunter-pic.jpgDr. 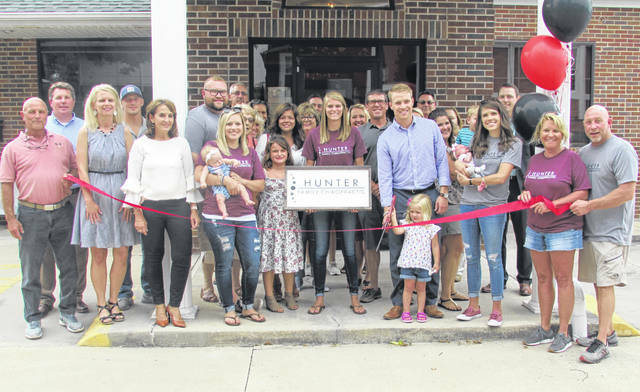 Dylan Hunter is pictured Friday cutting a grand opening ribbon with one his daughters, Evelyn, at Hunter Family Chiropractic, 219 W. Main St., Hillsboro. Pictured in front to the right are his wife, Jordan, and other daughter, Lucy, along his parents, Sue and John Hunter.